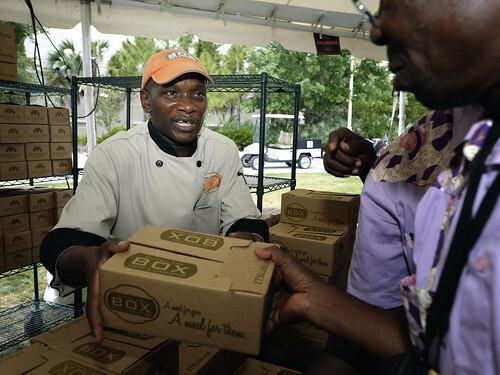 A UMNS Report By Elliott Wright* May 1, 2012 | TAMPA, Fla.
Lawrence Wilson delivers box lunches to participants in a May 1 celebration of Ministry With the Poor at a park near the site of the 2012 United Methodist General Conference in Tampa, Fla. The meal was provided by Inside the Box Catering, a project of Metropolitan Ministries' Social Entrepreneurship Initiative. A UMNS photo by Paul Jeffrey. Delegates and guests at General Conference 2012 ate and sang with homeless people in downtown Tampa at noon on May Day. The special occasion celebrated the church's emphasis on Ministry with the Poor. More than 500 people passed through a tent in a public park to receive free box lunches (volunteer donations welcomed) at "Break Bread With* Tampa," sponsored by a denominational task force on Ministry with the Poor, the church's Council of Bishops and local ministries. The watchword of the focus is ministry "with"-not "to" or "for"-the poor. Bishops, conference delegates from four continents, and local advocates for the poor kept time to the music of a choir from Côte d'Ivoire and a band made up of homeless men and women from Tampa. Most of the homeless who live in the immediate area looked on from outside the tent. Some of the bishops and delegates went out to join them. Booths at the noon event just inside the tent provided information on a large range of local, denominational and ecumenical ministries with the poor. Among these was Amazing Love Ministries of Tampa, which organized the choir of homeless persons. Amazing Love Ministries ran a food ministry in the parking lot at a United Methodist church for three years and recently obtained a building in the Ybor City section of Tampa. The few speeches at "Break Bread With* Tampa" pointed to the universal nature of God's love, and the shift of venues was a welcome break for conference delegates from the legislative tedium that consumes them in the convention center. The food was provided by Inside the Box, an initiative of Metropolitan Ministries. The enterprise runs a café and catering service that trains people, using expert instructions on ways to enter the food service industries. The largest display booth was that of the Coalition of Immokalee Workers, which is campaigning for a raise in the pay of Florida farmworkers. The display featured the containers in which workers put tomatoes picked by hand. Some "Break Bread With* Tampa" visitors tried to pick up one of the containers and found them amazingly heavy. The Rev. John Edgar, senior pastor of the Church For All People in Columbus, Ohio, served as emcee for the lunch program. His congregation is involved in an extensive community development effort in the Ohio city. Bishop Joel Martinez, chair of the Council of Bishops' committee on Ministry with the Poor, welcomed the crowd of diverse people. The event was planned by Dr. Mary Ellen Kris, consultant on Ministry with the Poor at the United Methodist Board of Global Ministries, and a team of volunteers from Tampa. The United Methodist General Conference is comprised of delegates from the United States, many parts of Africa, continental Europe and the Philippines. Local co-sponsors include Amazing Love Ministries, Cornerstone Ministries and Metropolitan Ministries. Later in the day, Communities of Shalom, an international ministry, offered training in faith-based community development at Hyde Park United Methodist Church, near the convention center. *Wright is an information consultant working with the General Board of Global Ministries. News media contact: Maggie Hillery, Tampa, Fla., (813) 574-4837, through May 4; after May 4, Nashville, Tenn., (615) 742-5470, or newsdesk@umcom.org.